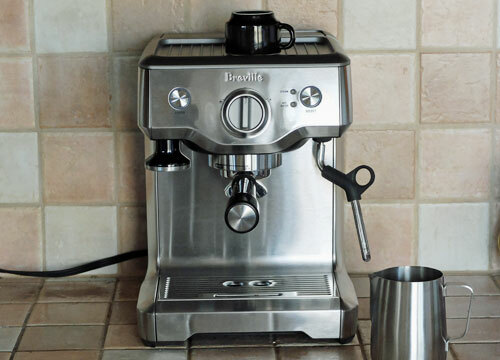 Our demo of the Breville Duo-Temp Pro espresso machine. 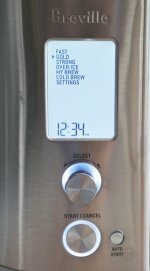 Our demo of the Breville Duo-Temp Pro home espresso machine. In a hurry to get one? The Breville Duo-Temp Pro is available at Amazon.com. This is a semi-automatic home espresso machine. By semi-automatic I mean that the machine automatically sets the temperature of the hot water and steam, and automatically sets the pressure when making the espresso. But it’s not fully automatic, because you remain in control of the timing of each shot you pull. Anyway, I was delighted to try Duo-Temp Pro as I own a much older Breville espresso machine, and was interested to see the difference. Long story short – the Duo-Temp Pro is much better, with a couple of features I really appreciate. First off, as its name suggests, it operates at two different temperatures. When you’ll pulling your shot of espresso, the temperature of the water is set at about 93 degrees Celsius. When you froth the milk, the temperature in changed to about 135 degrees. Once you have finished with the milk, the temperate automatically and quickly drops back to 93 degrees, ready for if you want to pull another shot. 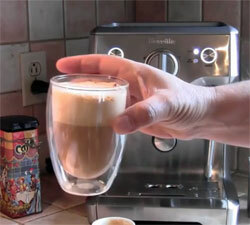 Most home espresso machines in this price range don’t have this feature. Either they compromise on the water temperature for both the espresso and the milk, or they are too slow to change the temperature for when you pull that second shot. Make you own espresso, cappuccino and latte. The other cool thing with this machine is its low–pressure pre-infusion process. In other words, when applying the water pressure to make the shot of espresso, it doesn’t immediately jump to the full pressure. First, it wets all the coffee grinds at low pressure. This prevents channeling, where the water pushes through at the points of least resistance...typically around the edges of the coffee. Pre-infusion ensures that all the coffee is wet before full pressure is applied. So you get a better, more even extraction. There are a couple of minor features I like too. The Duo-Temp comes with its own tamper, which is held in its storage spot with a magnet. I appreciate the inclusion of the tamper, and really like how the storage spot keeps it within easy reach. On the subject of storage, there is also a storage tray tucked in behind the drip tray. This is great for keeping your filter baskets, cleaning tools and so on. Actually, it’s really great, because I’m not a very organized person, and usually end up losing that stuff. One final point I’ll make is that this is an attractive and very solid machine. It doesn't have a fancy design, but has a classic look I really like, and it's totally functional. If you can’t find one locally, you can buy the Duo-Temp Pro Espresso Machine at Amazon.com. What is a knock box? A well used knock box at a local cafe. In the video at the top of the page I mention a “knock box”. A couple of people have emailed me and asked what that is. 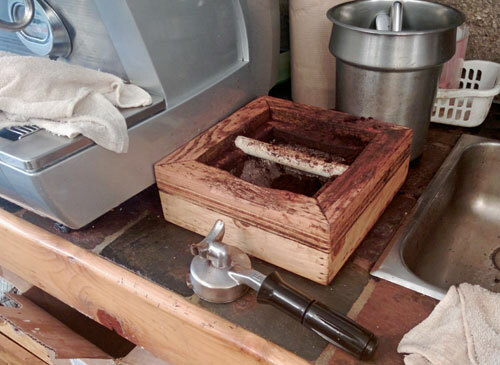 Basically, it’s a box with a bar across that top on which you can knock the portafilter to get the used espresso out. Again, if you can’t find one locally, there are a number of knock boxes at Amazon.com . 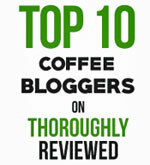 More information on espresso and espresso machines. 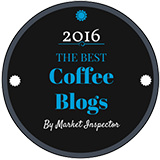 Choosing the right home espresso machine. The Breville Duo-Temp Pro, all cleaned up and looking good.